Each map or group of maps is separated by a gray bar. (Turn this plat to the right 90 degrees to see its proper orientation.) In 1743, Daniel McNeill of the Argyll Colony, called "Squire McNeill", bought from John Martinleer the tract which became "Tweedside". The course of the Cape Fear River was Tweedside's western boundary — in the center of which was Racoon Falls — about 13 miles above the mouth of Rockfish Creek. When Daniel McNeill first bought it Tweedside lay in Bladen County, and today it's now in that part of Cumberland County that was taken away in 1754 from old Bladen to form Cumberland. (The map below should be turned 90 degrees to the right to determine its correct orientation.). The eastern quarter of Tweesdside was cut off by the course of Dunfield Creek which empties into the Cape Fear River about 4 miles to the south. 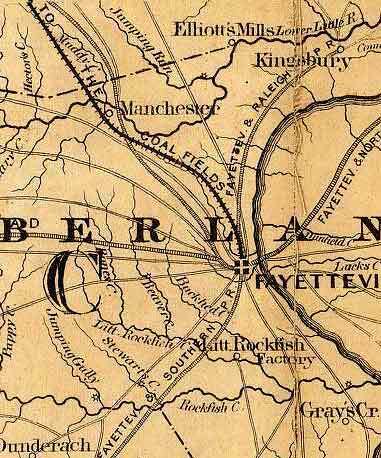 A map drawn by Dan MacMillan of Fayetteville housed at the NC Department of Archives and History shows Dunfield Creek closely paralleling the River Road through this eastern quarter of Tweedside. The map below comes from the survey for an 85-acre grant purchased by Duncan McAuslan in 1801, the husband of Daniel McNeill's granddaughter, the twice-widowed Jean (nee DuBois) Simpson Rutherford. Interestingly, Daniel McNeill had an adjoining tract of 150 acres on Tweedside's northern border that was split between Neill McPhaul and Daniel McPhaul of Bladen (now Robeson) County. All of Neill's land was confiscated due to his having been a Tory captain in the Revolution (and mortally wounded at the Battle of the Brick House near Wilmington, and died in Charleston, SC shortly after). The map below (I've created links within it) is a small section of a larger map, one of several created by Malcolm Fowler before 1980 as a result of his research on the early families of the Argyll Colony. This is Fowler's McKethan map and was created to show McKethan tracts around the Bluff area — also showing McAlesters and McNeills — including grants that pre-date the Argyll Colony of 1739. On its left side, the map shows 200 acres of an as yet unidentified Neill McNeill — probably Neill McNeill, father of Roger — who obtained it in 1742. On the tract next to it was located Roger's Meeting House and a cemetery; this structure is said to have been moved across the Cape Fear River and later became Bluff Church in 1783. Why the meeting house was named for Roger McNeill is unknown. Roger's father, Neill McNeill lived very close to "Little Neill" McNeill but Roger's father Neill and "Little Neill" were NOT one and the same man. The nickname "Little Neill" is written in an early Cumberland deed dated 1784 and the man himself is identified in an earlier deed dated 1761 wherein his wife was named Catherine. In the deed, "Little Neill" and Catherine donated the one acre on which the original Bluff Church was located before it was moved. Since Catherine had to co-sign the deed for the one acre on which sat the meeting house, one can suspect that the one acre came from what may have been part of lands that she brought with her into her marriage to "Little Neill". 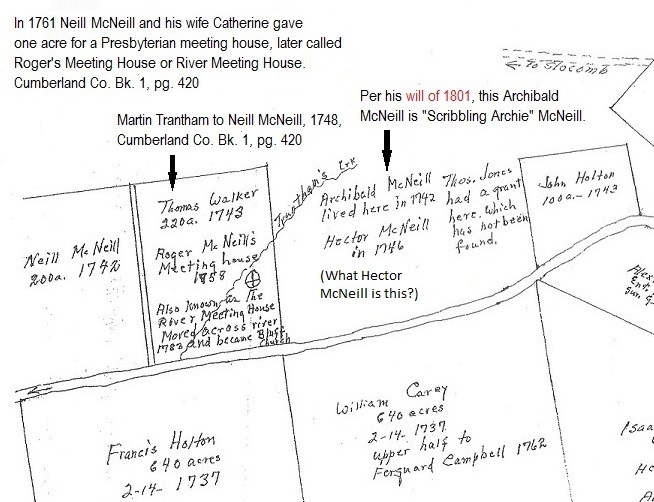 By researching Cumberland County deeds and his will of 1801, I suspect that the Archibald McNeill shown below (in deeds it's called "the land laid out for Archibald McNeill") was perhaps the earliest residence of "Scribbling Archie" McNeill before his marriage to "Jennie Bhan" Smith. A thorough reading of "Scribbling Archie" McNeill's will shows that by his death in 1801 he owned sizeable tracts on Tranthams Creek. How Fowler determined that an Archibald McNeill lived there in 1742 is unknown, and likewise his knowledge of Hector McNeill's being there in 1746. 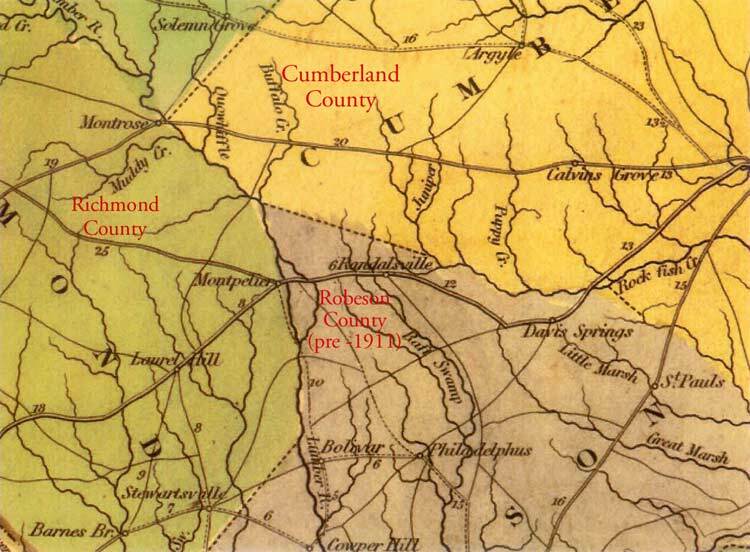 The northern corner of Robeson and the southwestern corner of Cumberland were taken from both counties to form Hoke County in 1911. I failed to find the source for this map, except the year the map was created. If anyone can identify this map, please contact me with that information. Thanks! John McPherson, Jr.'s 1829 Cumberland County tax entry, shown below, is shown because it has been believed that there were two John McPhersons who were neighbors at this time, and whose names were recorded adjacent to one another in the 1820 census. This double entry for John McPherson in the census (one on Rockfish and one on Beaver Creek a few miles away) only meant that he owned two separated tracts in the same district; indeed, the Beaver Creek tract appears to have had a household upon it. Indeed, the Beaver Creek tract became his widow Sallie's dower in 1830. When Sallie became pregnant out of wedlock in 1833, she moved to Lauderdale County, Mississippi, selling her dower to her son Edward. The total acreage of the two tracts was 1326 acres. The tax entry for 1829 and the years preceeding it clearly show there was only one John McPherson with 1326 acres of land. His 1829 estate record further proves this. The area south of Red Springs, including Philadelphus, Buie, the area just west of the Great Desert, and the Blackfork region of upper Robeson County, NC. Source: 1922 Woodberry Lennon map, North Carolina Dept. of Archives and History. Notice that Little Raft Swamp and McPhaul's Mill Swamp are the same watercourse. The Blackfork region, the wedge of land between Big and Little Raft Swamps, is in the top right quarter of the map. The broad delineations are township boundaries. 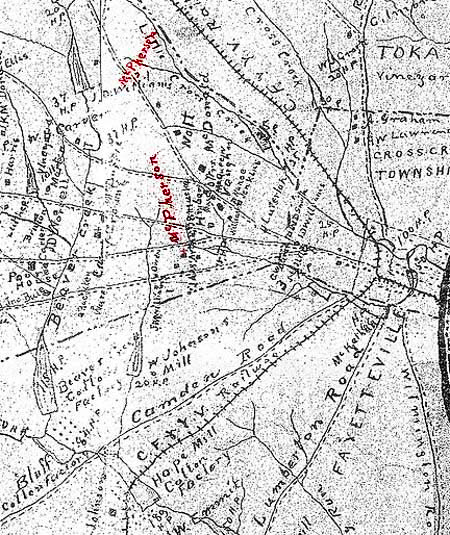 Also, Richland Swamp, shown below running through Brown's Pond at Philadephus, was known in early records as Soloman's Swamp and later as Scolding Branch. The McNeill section of McCaskill's cemetery at Philippi Church in Cumberland County, NC. This cemetery is within two miles or so west of Raeford, NC, at Philippi Presbyterian Church. It is possibly where Turquill McNeill of the Argyll Colony is buried, as well as James McNeill of Rockfish Creek (aka 'Jimmie McNeill of McCaskills Creek'. ), and other local Scots of their time. Click the image of the little grave with the sandstone marker to see the inscription. The inscription had flour rubbed into it to make it more readable. It says "J. McNeill APTH 1800." APTH may be a misspelling of a latin or greek word meaning "tomb" or "burial." 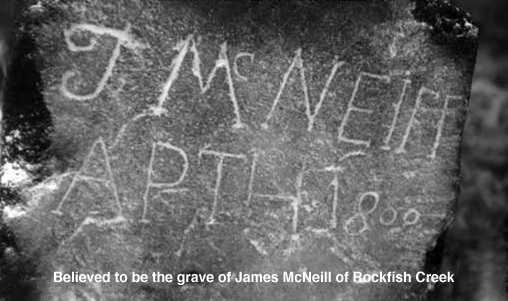 This is likely the grave of James McNeill of Rockfish Creek. My mother wrote before her death that her grandfather, J.F. "Frank" McKay (1849-1941), told her that James McNeill came to America in 1740. The grave of Duncan McNeill, Sr. is that of "Long Duncan" McNeill; Long Duncan's wife Margaret (daughter of James McNeill of Rockfish Creek) is buried beside him. Long Duncan McNeill was the son of Turquill McNeill of the Argyll Colony. Archibald "Archie Ghar" McNeill was buried in this cemetery next to his wife, Barbara Patterson McNeill (close to "Long Duncan" McNeill's grave) but, today, Archie's tombstone is missing. 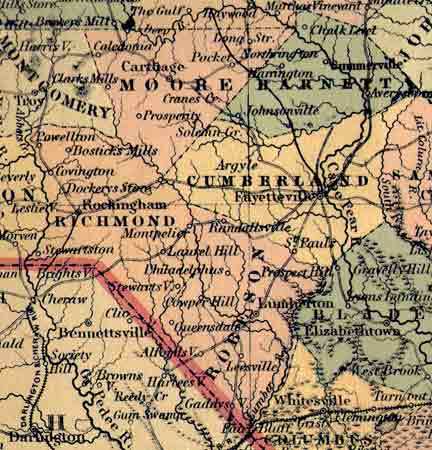 A section of the 1884 McDuffie map of Cumberland County, NC, showing the general location of two McPherson families' landholdings (written over in red) west of Fayetteville and the Cape Fear River. One is just left of center, and the other is right above it near the top. The McPherson lands at the top combine the Malcolm McPherson and Alexander McPherson of Jura lands. The McPherson lands toward the bottom are the lands of Old John McPherson who entered tracts to be surveyed in 1753; the small cross beneath that area is the site of McPherson Presbyterian Church, the lands of which were donated in 1802 by Colin McPherson, the grandson of Old John McPherson of the Argyll Colony. 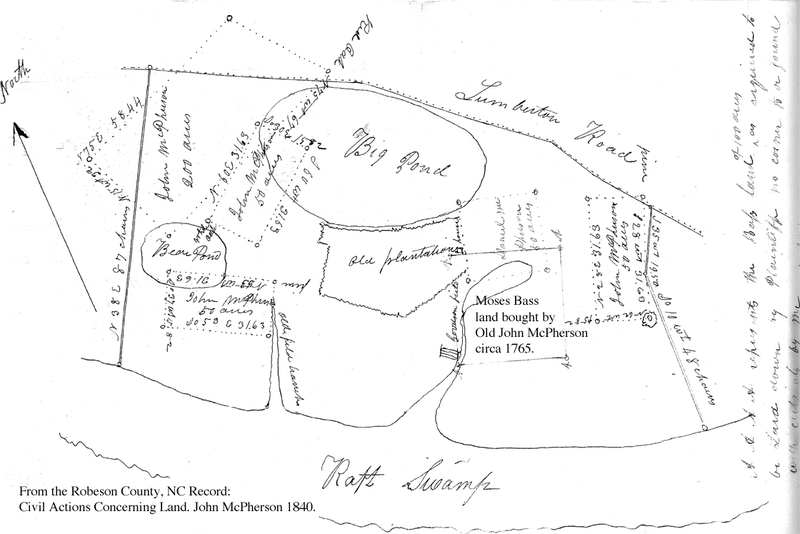 A map of the lands and homesite area of James McNeill of Rockfish and his wife Elizabeth (nee McNeill) McNeill. James McNeill of Rockfish Creek (aka Jimmie McNeill of McCaskills) is known to have lived inside Cumberland County near McCaskills Bridge on Big Rockfish Creek near Philippi Church and cemetery. Most all of his lands were in Robeson County on the opposite side of Big Rockfish. Philippi cemetery, originally called McCaskills cemetery, was an early burial place for Scottish settlers. The map has links within it to information about some of the McNeills shown. The men shown come from the research of Dan MacMillan of Fayetteville who placed them on one of his maps that I used for my research on James McNeill and some of his neighbors. I'm particularly interested in the Hector McNeill near Lauchlin Cameron just south of Dukeminers Branch. I believe this Hector wrote his will in 1778 naming his wife Margaret and leaving slaves to the Bluff McNeills and a John Johnston. He mentions Lauc Cameron and his mother Isabella Buie. 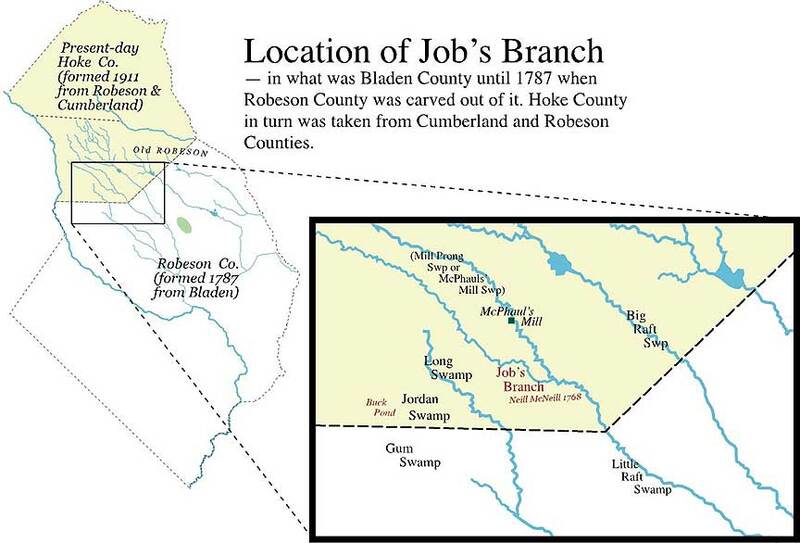 Location of Job's (or Jobe's) Branch, the seat of Neill McNeill's lands in Hoke County, NC. It also could be the location of "Neill McNeill's burial ground" mentioned by Col. Neil Buie in his 1828 deposition which provided details about the time and burial place of Daniel and Marian McNeill McPherson's young son Archibald. 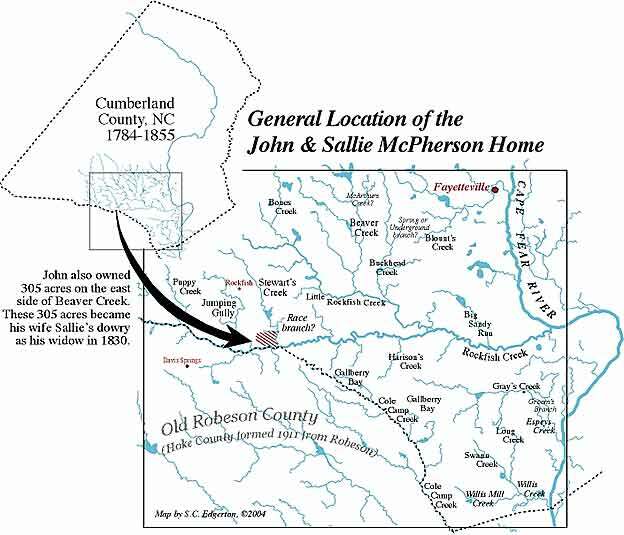 According to James M. Roberts in his history of the descendants of "Sailor Hector" McNeill, Sailor Hector's father Neill McNeill was buried "in front of 'Big Will' McNeill's house on Duffie Road, Robeson County, N.C." Is Roberts's statement incorrect about the house being in Robeson—could it have been just across the border into southern Hoke County? A map given to me by Ruth McArthur (given to her by her cousin Charles McNeill who still lives in Red Springs circa 2005) shows Big Will's house was at the entrance to Greenbriar on Duffie Road. The surveyor's plat below is found in a folder called "John McPherson, 1840" under "Civil Actions Concerning Land" in the Robeson County records at the NC Dept. of Archives and History. I recommend such records to any researcher for all the genealogical and property information that can determine land location, vanished landmark names, time of purchase and purchasee, and possibly distribution by heirs of the original owner(s). This map shows in detail the disjointed grants and tracts bought by Old John McPherson and his son Daniel dating from the 1760s up to around the time of Old John's death in 1791. The land between the various plats was by 1820 entirely owned by the McPherson family, and the whole as shown below is half of the McPherson family estate disputed from about 1823 until 1845 by Old John's granddaughter Catherine McPherson Brown and her brother-in-law Gilbert Gilchrist. 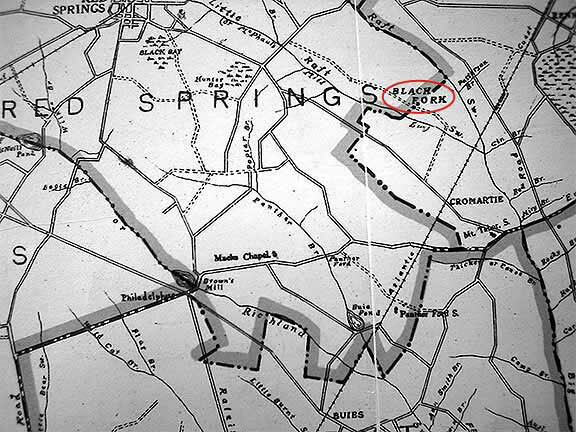 The other half—some 1100 acres owned by Hugh and Colin McPherson from 1796 until the year 1823 when they were both deceased—adjoins the lands shown below on their left edge and likewise lay between the Lumberton Road and Raft Swamp, and continued beyond the location of the bridge at Juniper Branch and the Raft Swamp further on. There appears to have been a Juniper Branch on both sides of the Raft Swamp and they drained into the swamp at the same place, but I may be wrong about this. The "old plantation", centrally located in the middle of the map, is probably the first tract purchased by Old John McPherson upon settling in Bladen County in the mid-1760s, and which he probably acquired at the same time he bought the Moses Bass tract (Moses Bass, found in the 1755 Cumberland County tax list, owned a mill in this region and lived on this tract in 1758). McPherson's log home was located in this irregular-shaped tract on its far right side, marked by a tiny box. The Big Pond and the Bear Pond are now gone, certainly drained and cleared by subsequent owners, but which can be seen on the topozone map (see next map below) if it is compared with the hand drawn map shown just below this text. 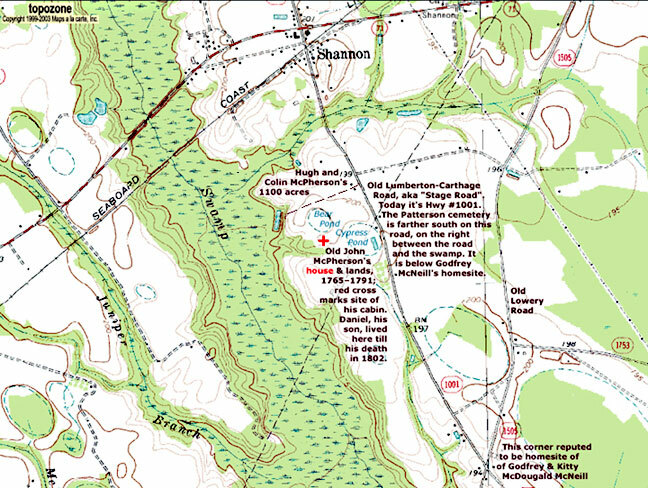 With regard to the two maps below, it should be noted that Juniper Branch, now located as a branch draining into the Raft Swamp from its south side, was originally the small branch draining into the Raft Swamp from its north side (see topozone map below). I have come to suspect that at the time the McPhersons owned this land, Juniper Branch drained into the Raft Swamp from the north and south side of the swamp because the topo map below shows that a branch did at one time drain into the swamp on the north side of the swamp directly across from today's Juniper Branch on the south side. This entire estate was located just above the current intersection called McLeod's Crossing in northern Robeson County, just east of Red Springs. McLeod's Crossing was originally called "Godfrey's Crossing" as it was the crossing of the Old Lowery Road and Lumberton-Carthage Road where Godfrey McNeill's house stood. After that it was called "Weaver Neill McLean's Crossing". It has been said the house standing there today on a rise near the intersection's northeast corner was indeed Godfrey McNeill's house, but this is yet to be proven. In the late 1700s, other neighbors in this area included the families: Council, Peter Dallas, Henderson, "Big John" Johnston and his son Daniel Johnston, Esq., Alexander McArthur, Peter and wife Peggy Campbell McArthur (2nd McArthur link), John McBryde, Daniel McIntaggart, Godfrey McNeill and Malcolm Munroe and Peter Munroe. Topozone.com is a very good site with which you can match current topography with surveyor's plats. Compare the map below with the plat of Old John's land just above. The town of Shannon is almost due north of the red cross, which is the site of Old John McPherson's cabin. I took the topozone map into Photoshop and added the text and labels pertaining to the McPhersons and their property. At the bottom of the map is the reputed homesite of Godfrey McNeill, at what was called Godfrey's Crossing and is now referred to as McLeod's Crossing. This crossing is the intersection of the old Lowry Road (Hwy 1505) and the Carthage to Lumberton Stage Coach Road (Hwy 1001).